All audience reviews of Damadamm! So Himesh Reshammiya insists on making it as an actor. Fortunately this time it works for the simple reason that you are willing to forgive him after the previous debacles. Himesh the actor has a nonexistent fan base and this film is unlikely to expand that. But as a producer he has picked an interesting script. The film follows the adventures of one Sameer (Himesh) who has been gifted 15 days freedom from his over possessive girlfriend (Purabi Joshi). In this time he begins to explore his free nature and falls for the boss' sister (Sonal Sehgal). He breaks the shackles of the redundant relationship but this new found independence comes at a cost far too emotional for the hero to handle. The first half of the film is quite fun as Joshi takes center stage and manages to bring in many laughs. The second half takes an emotional turn when Himesh's character can't deal with breaking the heart of the girl he once loved. It is here that the film falters. Neither the characters nor their dilemmas make for an interesting film and you watch them from a distance never once feeling what you felt in the first part. Some of the plot points also seem forced and most of the songs are out of place. The film falls into the very sappy trap that it lays for its audience. Himesh has an emotional range of a teacup and Purabi Joshi looks more petrified than poignant. Sonal Sehgal is easy to like and manages to balance the situation where the other two take it over-the-top. First time director Swapna Joshi is very raw and her lack of experience clearly shows on screen. A better cast and director would have made this a much better film. 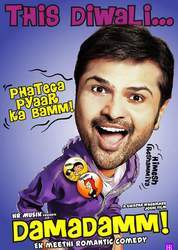 The music of the film is good and Himesh fans would love it. Especially the "Umraao Jaan" number that plays over the closing credits. You could totally watch this film if you fail to get tickets to some of the other big releases this busy weekend. But it'll make for a much better viewing on DVD at home. 2.5 stars. Absolutely No Dum In Damadamm! !